For the past few years a Wolverhampton based driving instructor has been helping company van drivers and local authority staff drive more safely and cheaply. Danny Kharbanda is one of the instructors qualified to deliver the Department of Transport SAFED scheme – teaching Safe And Fuel Efficient Driving (SAFED) for van drivers. 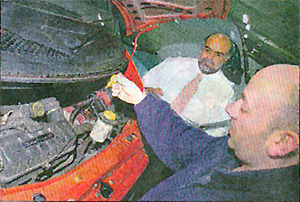 Drivers on the SAFED course are monitored on the pre-journey vehicle checks they carry out at work. This has involved instructing drivers working for a number of local authorities and staff at a string of companies around the region. A qualified instructor for 25 years, and badged fleet trainer, the 46-year-old has been a motoring enthusiast since his teens. “Because I lost my left eye when I was young I was told I might never be able to have a driving licence. I passed my Advanced Driving Test when I was 17 as a way of proving that I could do it, despite what people had said”. Since then he has worked for companies like BSM and the AA, but is currently his own boss, running Springfield DTS providing a range of driver training schemes as well as hosting corporate days out on skid pans or off-road. He is currently keeping busy travelling around the country delivering SAFED to a range of clients. Although billed as a “green” scheme because of its environmental benefits, the SAFED scheme has offered real business benefits such as higher miles per gallon figures, lower fuel bills, reduced wear and tear on gearboxes and the insurance benefits of safer driving. The £1.3 million scheme was launched by Transport Secretary Alistair Darling a year ago. Managed by consultants Momenta on behalf of the Department for Transport it aims to train up to 200 approved driving instructors and delivering courses to 3,500 van drivers by the end of June 2006, which has been extended with further funding to 2007. 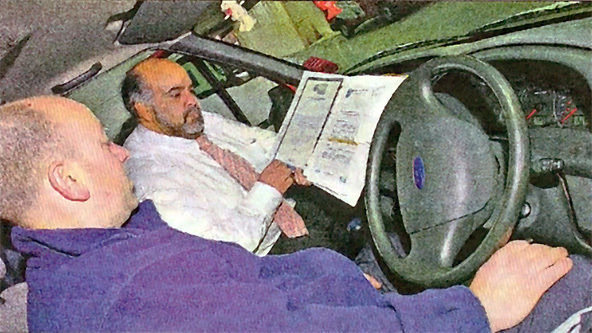 Danny Kharbanda prepares a driver for a SAFED test. Initial assessments of the pilot project found it cuts fuel consumption by around ten per cent. But, says Danny, a more recent audit of different SAFED courses around the country found it improved miles per gallon by 21.9 per cent, reduced gear changes by 33.8 per cent and reduced faults in driving by 62 per cent, in return for just a 2.22 per cent increase in travel time – less than 40 seconds over a half hour of driving. 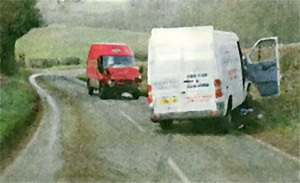 The SAFED days run by his Roadkraft business usually take a single day, with one instructor working with two van drivers. “We run through their day with them, what checks they do on the vans, what routes they follow, and then they each drive for half an hour on one of their regular journeys, with our instructor taking notes on every error they make, counting every gear change. We also measure how much fuel has been used. “The instructor will then follow the same route, giving them a running commentary of how he is driving. They then all sit down and compare notes, he will talk to them about some defensive driving techniques and about ways they could improve. “The two drivers then each get to go out again, on the same route, and put what they have learnt into practice. For instance, on the first half hour drive someone will probably make 90 or 100 gear changes. On the second they are making just 30 or 40.